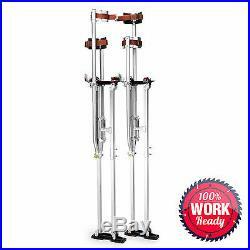 Drywall Stilts Painters Walking Taping Finishing Tools – Adjustable 48″ – 64″. 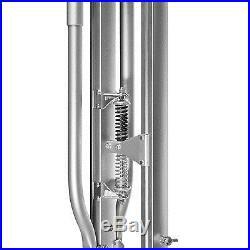 Precision Manufactured – Crafted from high-grade aluminum, these stilts are light enough to use all day, but sturdy enough to last for years. Versatile – Suitable for drywall, painting, wiring, and much more. Sturdy – A non-rocking frame with overlapping, industrial strut tubes is paired with an adjustable, dual-spring flex-system for excellent mobility. Adjustable Height – Using a wing-nut design, no tools are required to adjust the height to any of the 5 available height positions. Easy to Use – Shoe and leg straps are fully-adjustable with auto-locking buckles for quick stilt use/removal, and extra-wide padded calf braces plus three-position adjustable heel plates accommodate any user. 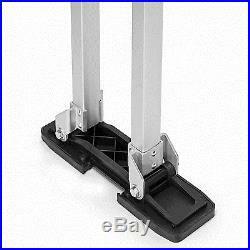 Anti-slip Feet – Bases are made in large, textured, high-grade rubber and are non-marring to protect floors. 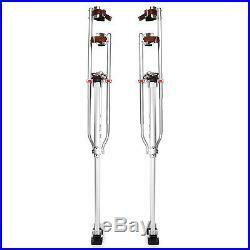 Specifications – Working heights: 48″ – 64″ Stilt weight: 11.25 pounds. 1 Pair of stilts. 2 Extra calf braces and strut tubes. 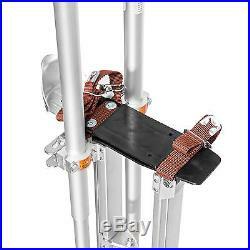 Owner’s manual with assembly instructions, maintenance suggestions, and stilt-walking tips. 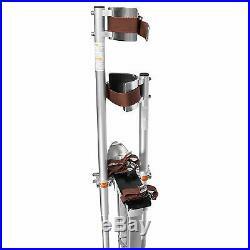 The item “Drywall Stilts Painters Walking Taping Finishing Tools Adjustable 48 64″ is in sale since Monday, May 18, 2015. 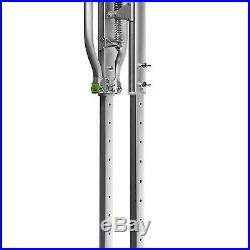 This item is in the category “Business & Industrial\Light Equipment & Tools\Drywall Tools\Stilts”. The seller is “assortedtools” and is located in Fort Lauderdale, FL. This item can be shipped to United States, Canada, United Kingdom, Denmark, Romania, Slovakia, Bulgaria, Czech republic, Finland, Hungary, Latvia, Lithuania, Malta, Estonia, Greece, Portugal, Cyprus, Slovenia, Japan, China, Sweden, South Korea, Belgium, France, Ireland, Netherlands, Poland, Spain, Italy, Germany, Austria, Mexico, Switzerland, Norway, Ukraine, Croatia, Chile, Colombia, Costa rica, Dominican republic, Panama, Trinidad and tobago, Guatemala, El salvador, Honduras, Jamaica, Antigua and barbuda, Aruba, Belize, Dominica, Grenada, Saint kitts and nevis, Saint lucia, Montserrat, Turks and caicos islands, Barbados, Bangladesh, Bermuda, Bolivia, Ecuador, French guiana, Guernsey, Gibraltar, Guadeloupe, Iceland, Jersey, Cayman islands, Liechtenstein, Sri lanka, Luxembourg, Monaco, Martinique, Maldives, Nicaragua, Peru, Pakistan, Paraguay.